U.S. and EU lead diplomatic push at U.N. and Turkey calls on Iran and Russia to pursue cease-fire; summit fails to bridge differences. 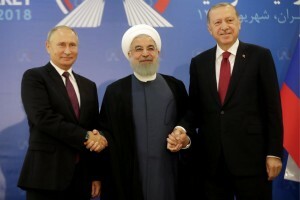 The U.S. and European Union led a diplomatic effort at the United Nations on Friday to prevent a Syrian offensive on the opposition’s last stronghold, while Turkey’s president urged his counterparts in Russia and Iran to adopt a cease-fire allowing for rebels to lay down arms. Diplomats and U.N. officials said they feared an attack on Idlib, a city in Syria’s northwest with three million civilian inhabitants, was imminent. The Assad regime’s elite army units and Republican Guards have been deployed to the area and now surround the city, diplomats said. Russia and Syrian warplanes this week began airstrikes on Idlib.